1.The extrusion channel made from high quality aluminum is designed for flexible or rigid LED strips that are less than 12mm wide. 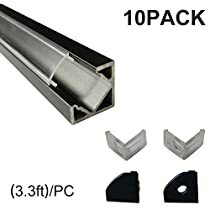 2.This kit includes the channel, cover, end caps, and mounting clips needed for a complete aluminum channel installation. Covers shade and protect LEDs inside the profile. End caps protect the extrusion from dust and other undesirable elements, which can make LED strips dirty and consequently deteriorate the lighting parameters. The mounting bracket guarantees easy and secure mounting of the extrusion to a desired surface. 3.The extrusion with LED light source is mostly used as interior lighting, especially to light cabinets, stairs, glass-cases, or as a decoration light for a niche in drywall ceilings.